Street art. Exhibitions. Art shows. Any situation where the public can see (and comment) on your art can be intimidating—at least it would be for me. But it can also be incredibly motivating. It’s amazing how creative and diverse the artists’ works are. You can tell just how much thought and care went into each sculpture. And I’m happy to announce that this month’s featured artist can give us a glimpse into what it was like to make and display one of them. 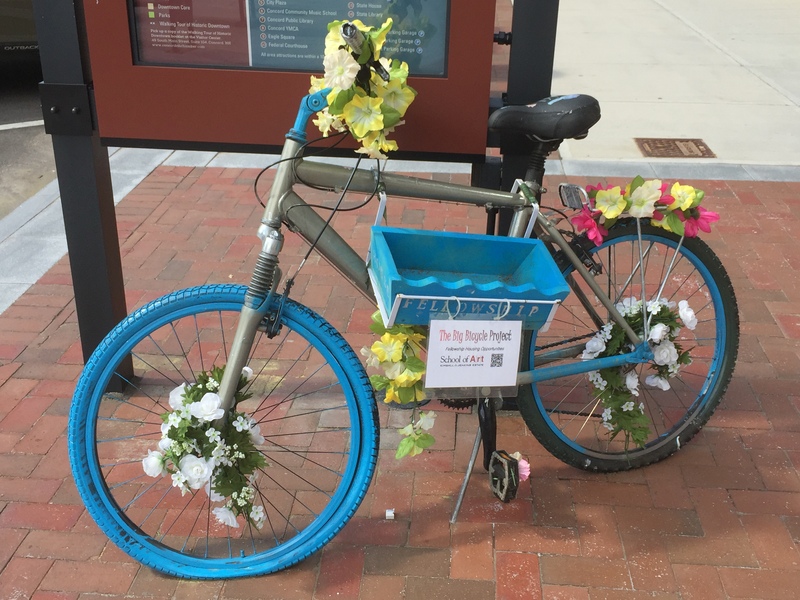 What did you think when you heard about the bicycle challenge? Have you participated in similar projects before? 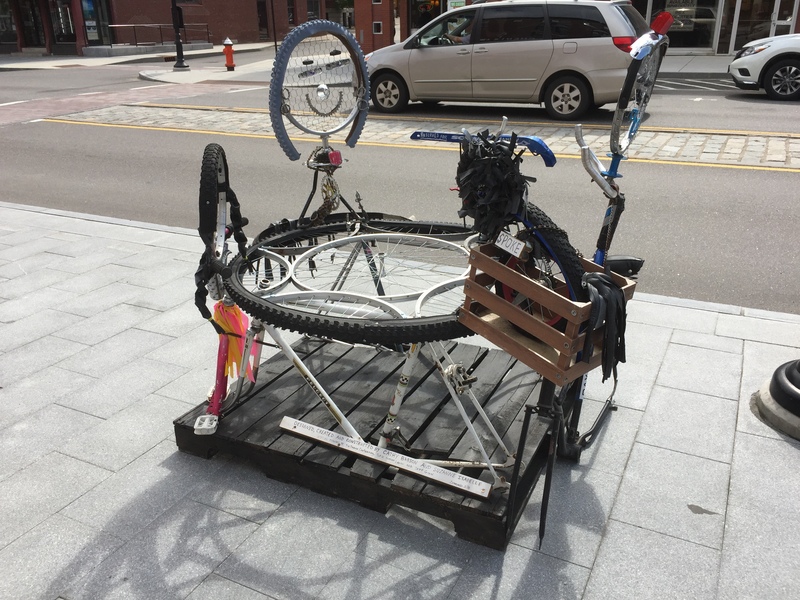 A: I loved the idea of ordinary people using a commonplace object like a bicycle to create unique works of public art. And for me, having an interesting project with a deadline is a great motivator. 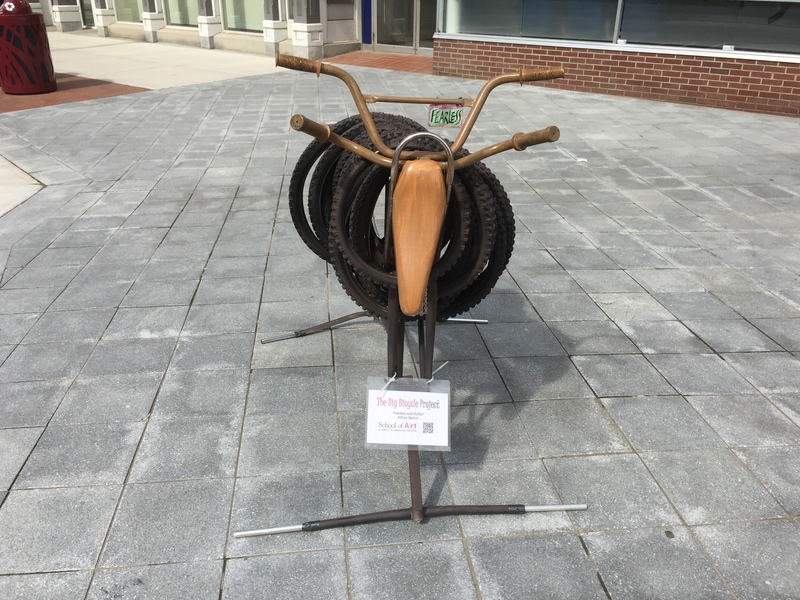 I’ve taken art classes, shown some work in student art exhibits, and once sold a painting of a fire station to a Manhattan fire chief, but I’d never done a sculpture project like this one before. What was the inspiration behind your sculpture? A: I was inspired by the controversy over the Fearless Girl statue that had been placed opposite the Charging Bull on Wall Street in NYC. Fearless Girl is a beautiful statue, and I was interested in how it engaged people in a dialogue about power. I’m sorry to hear about Bullish. Were there any particular challenges you had or lessons you’ve learned in creating your artwork? A: Welding is intense, amazing, and fun! My son and I learned basic welding at Manchester Makerspace, where the people were very supportive and encouraging. 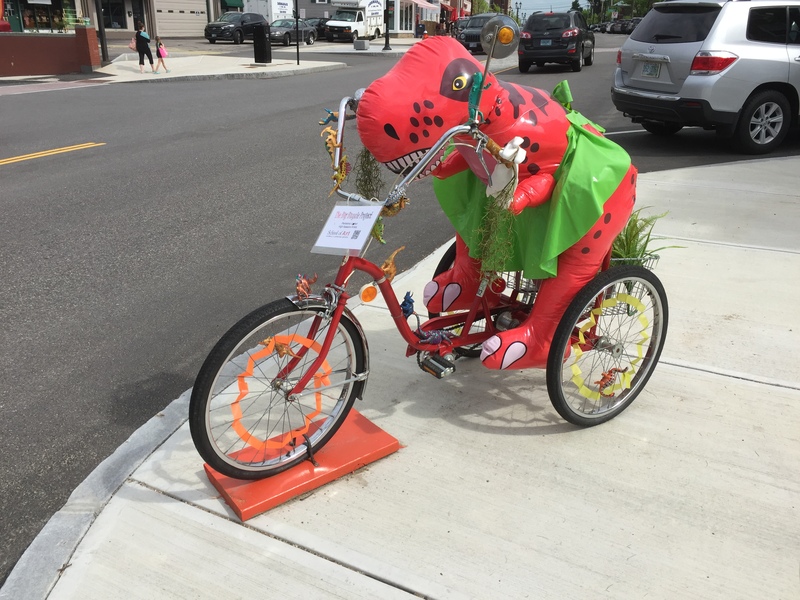 What is it like to have your sculptures displayed in such a public place like Main Street? Were you nervous to have such a large audience, or was it more exciting? 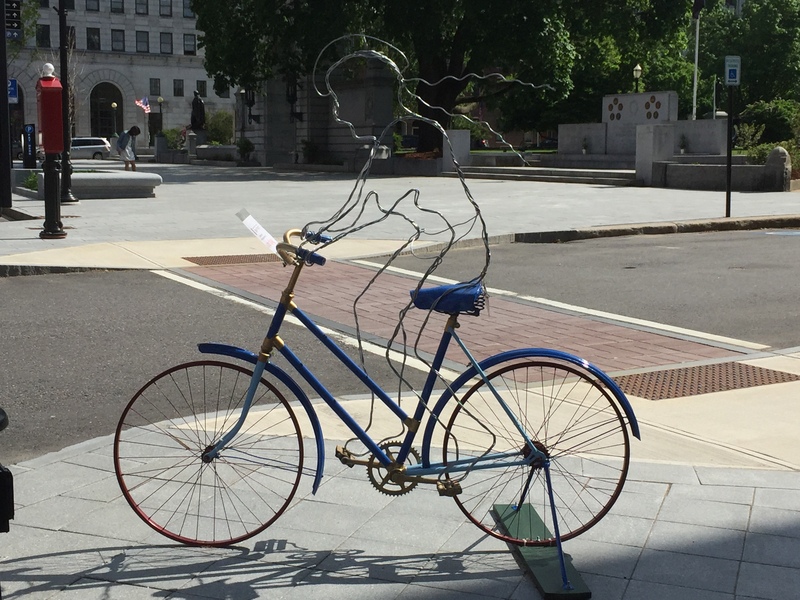 A: It was very motivating to know the sculptures would be displayed on Main Street. It kept me striving. Is there anything you’d like to say to artists thinking about being a part of an exhibition? Lastly, do you have a website or social media where people can follow your upcoming work? A: Not a personal one, though you can follow the Big Bicycle Project at www.kimballjenkins.com. 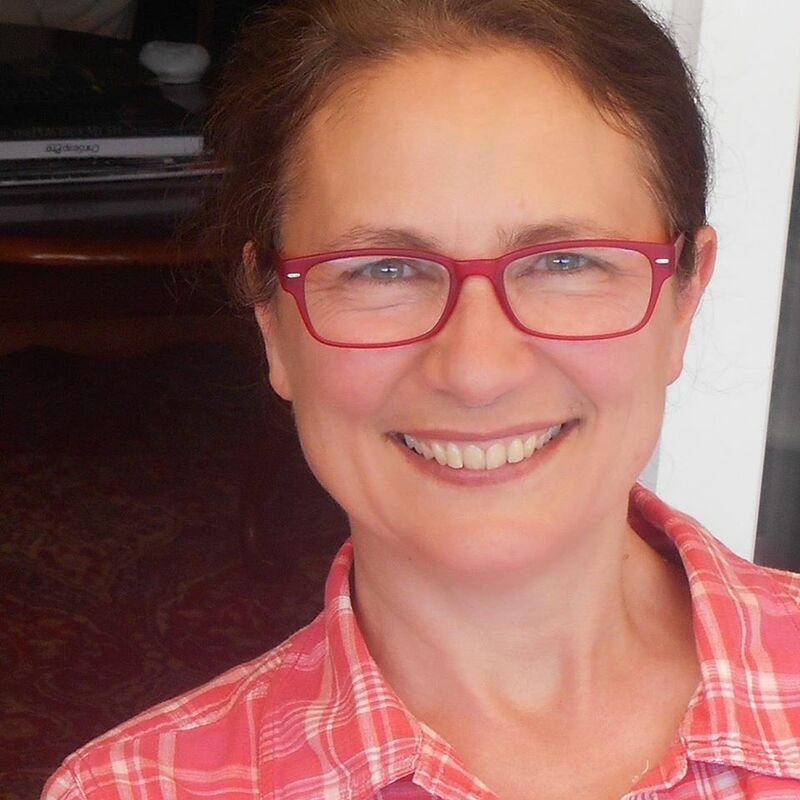 Thanks for your interest—enjoy your art! Thank you so much Althea! 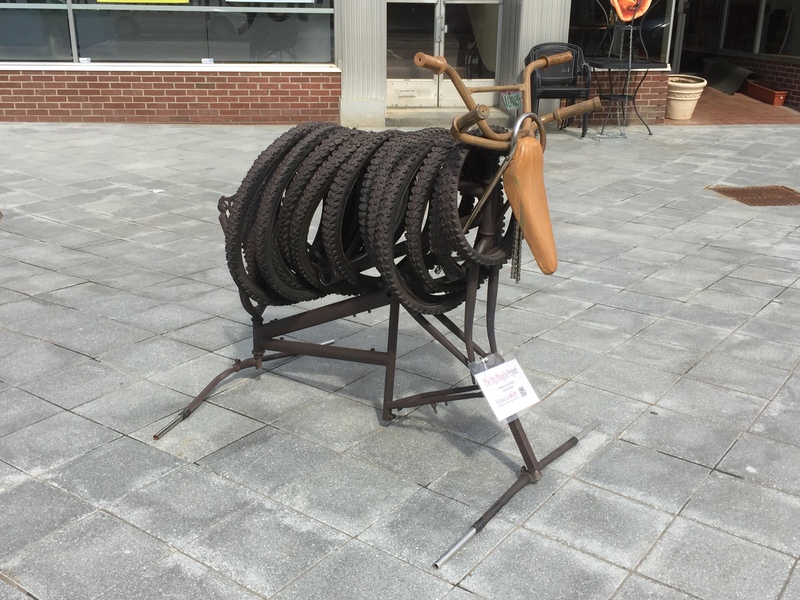 You can find Althea’s and the other artists’ sculptures on Main Street through November. It’s been said that Kimball-Jenkins has plans for future exhibitions, and I’ll be sure to let you know what they are when I hear about them. And who knows? After hearing what Althea had to say, I’m summoning the courage and getting excited about potentially participating in a future challenge. What’s good for both the environment and the art world? Upcycling. Also known as ‘creative reuse’, it’s a trend from the 1990’s that’s still going strong today. 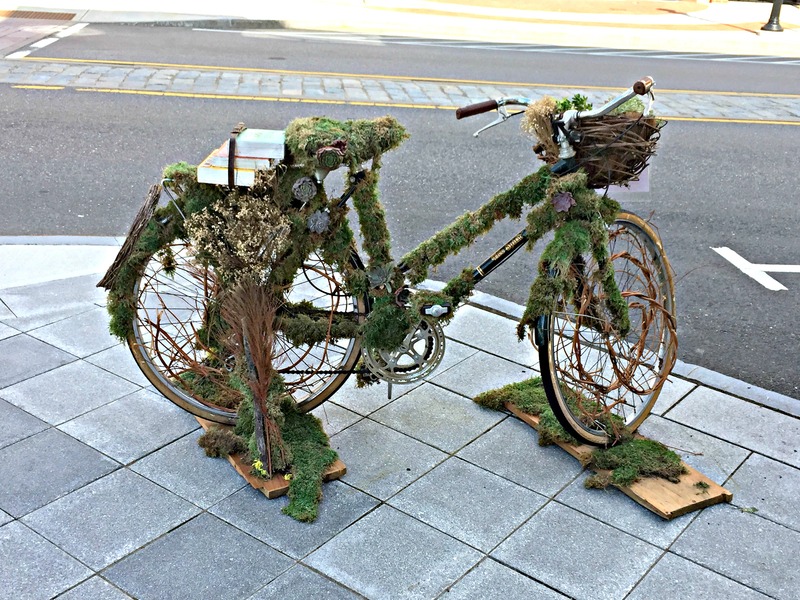 The idea is to repurpose something run down into something new and often beautiful or useful (or both). 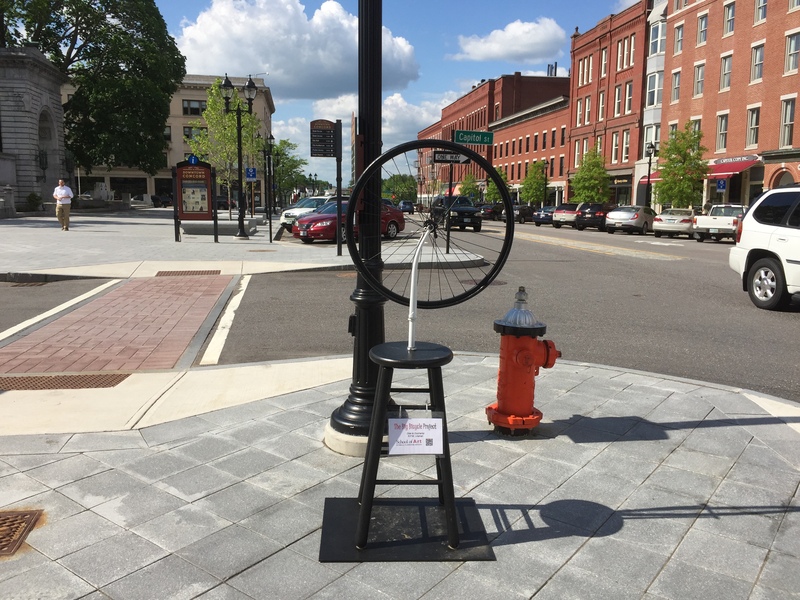 A current exhibition by the Kimball-Jenkins School of Art, sponsored by the Mill Brook Gallery & Sculpture Garden, in Concord, New Hampshire involves just that. 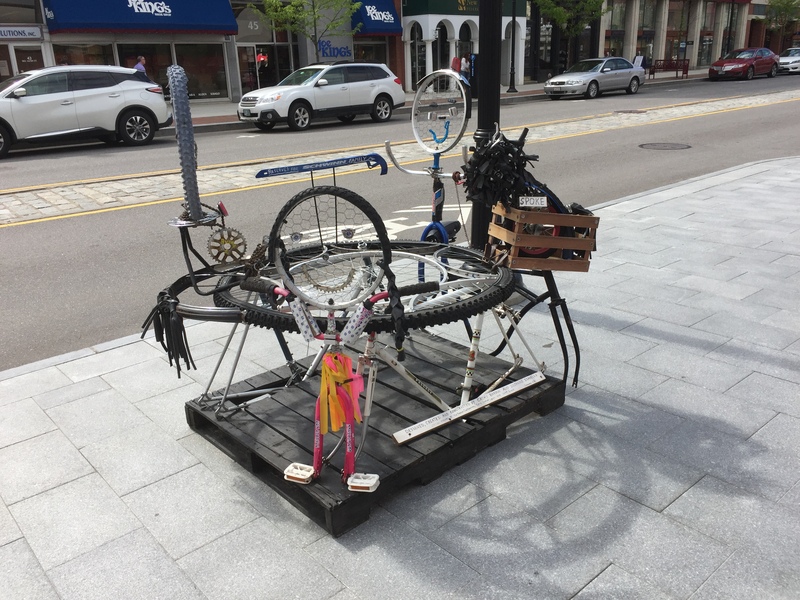 Locals artist were invited to contribute a sculpture made from a bicycle. 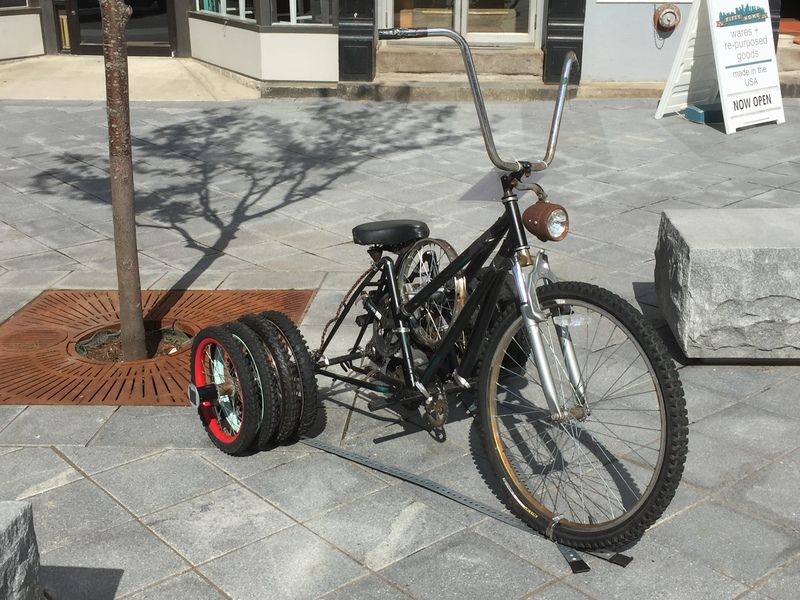 This could mean decorating an existing bike, or breaking one down into a brand new creation. 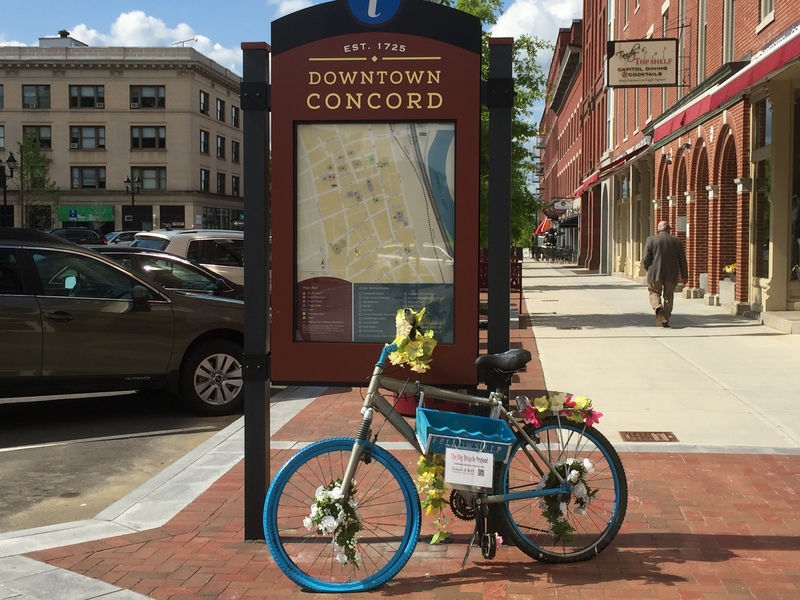 Starting in May, all of the finished sculptures were put on display along Concord’s North and South Main Street. 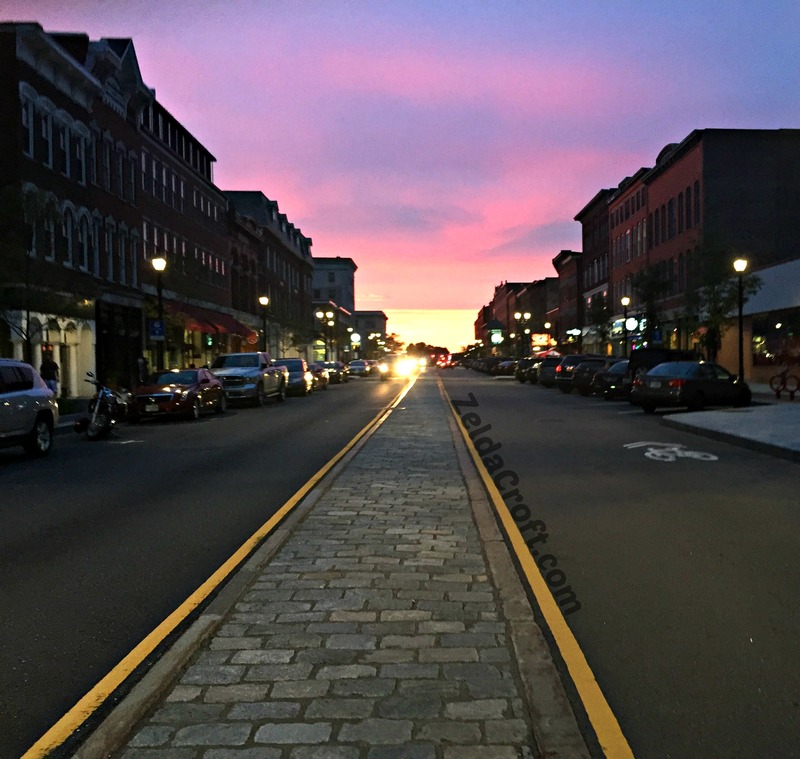 If you’ve never been, it’s a beautiful, historic place to walk and shop, and the new art additions only add to the splendor. One of my favorite pictures I’ve taken on Main Street. As peaceful as Main Street is, some of the displays weren’t left undisturbed. 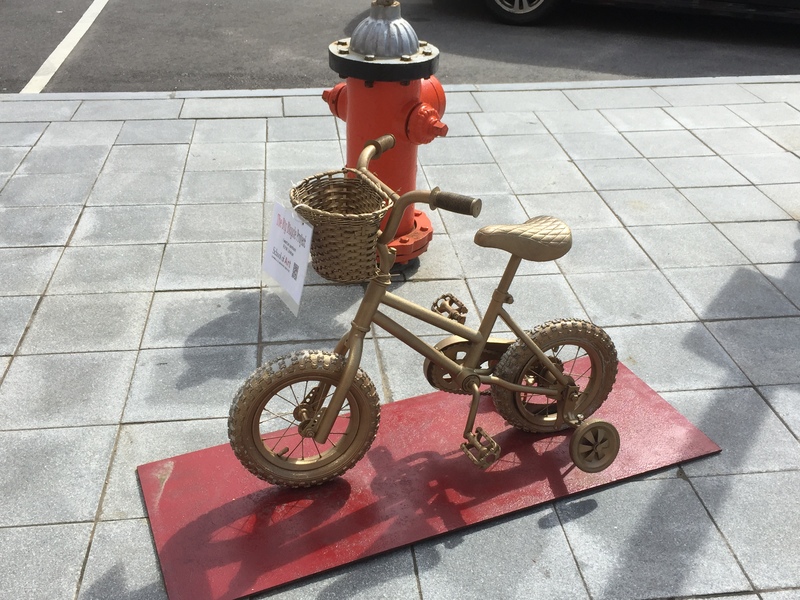 Sadly, two objects went missing: Fearless’s pink tricycle companion, Bullish, as well as an aardvark stuffed animal from the golden bike’s basket. Nevertheless, the sculptures are beautifully creative. I love how diverse the concepts are. 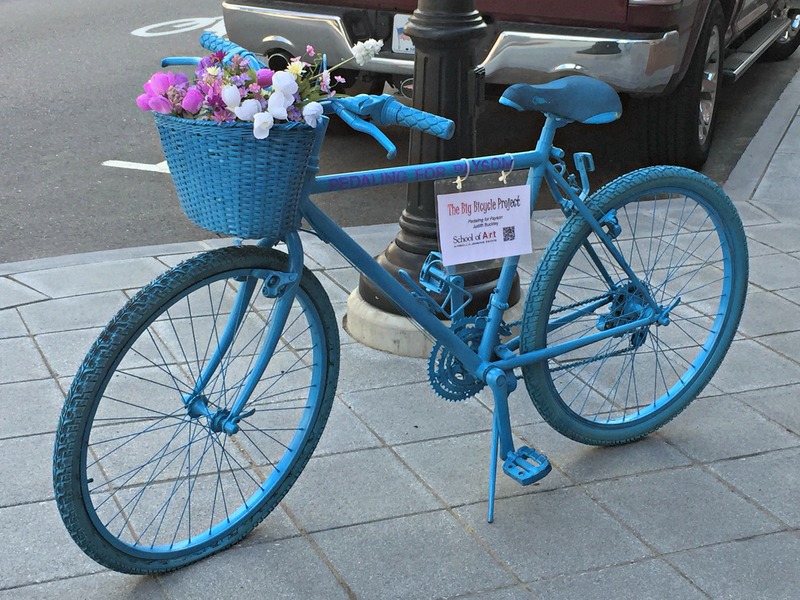 Not just the appealing visual aspect, but also how resourceful some of the artists were in repurposing bicycles into new piece of art. I heard that some participants learned skills like blacksmithing in order to make their sculpture. 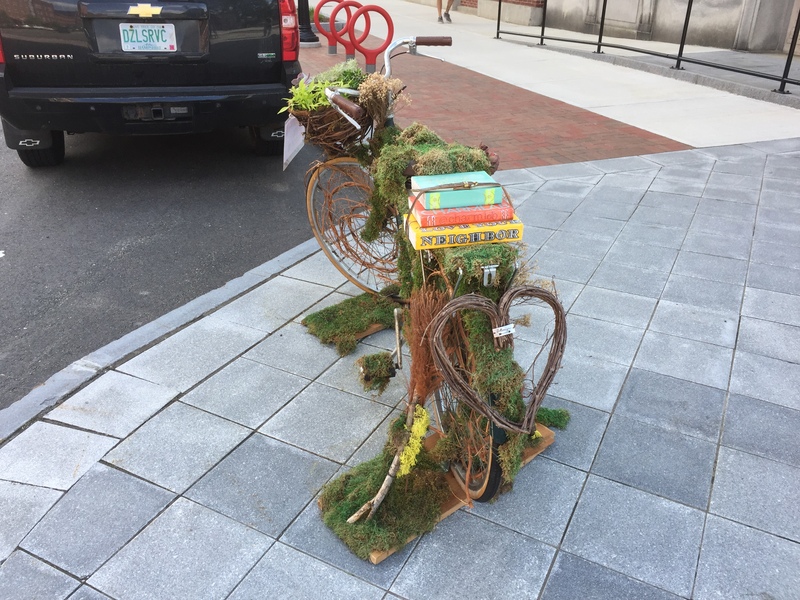 If you find yourself near Main Street and in the mood for a nice walk, I highly encourage you to take a stroll past these upcycled works of art. They’ll be lining the street through this November. But Kimball-Jenkins has said more exhibitions are to come, so be sure to stay tuned! If you’d like to read more about the project and the School of Art at Kimball-Jenkins Estate, you can visit their website here. Which bikes were your favorites? Have you ever participated in a project like this? I’d love to hear in the comments below!